. : Caldwell Sport comes to Canada! :: Ski XCOttawa.ca :: Skiing in Ottawa and Gatineau Park :. Caldwell Sport comes to Canada! Zach Caldwell, owner operator of Caldwell Sport (www.caldwellsport.com), is in the midst of setting up his new headquarters in Squamish B.C. This means that it will be much easier for Canadian racers to make use of Caldwell Sport services in stone grinding and ski evaluation. Most of XC Ottawa have been customers of Caldwell Sport for the last several years and some of us have even been to visit Zach, his wife Amy and son Gunnar in their real home near Putney, Vermont (www.xcottawa.ca/articles.php?id=571). Caldwell Sport, along with its US-based partner, Boulder Nordic Sport (www.bouldernordicsport.com) offers specialized and unique services in both ski evaluation/selection and stone grinding. Zach has extensive experience with basically anything related to ski equipment and waxing. Over the past several years he has worked very closely with elite skiers and teams including Kris Freeman, the US Ski Team, and Fischer-Craft. 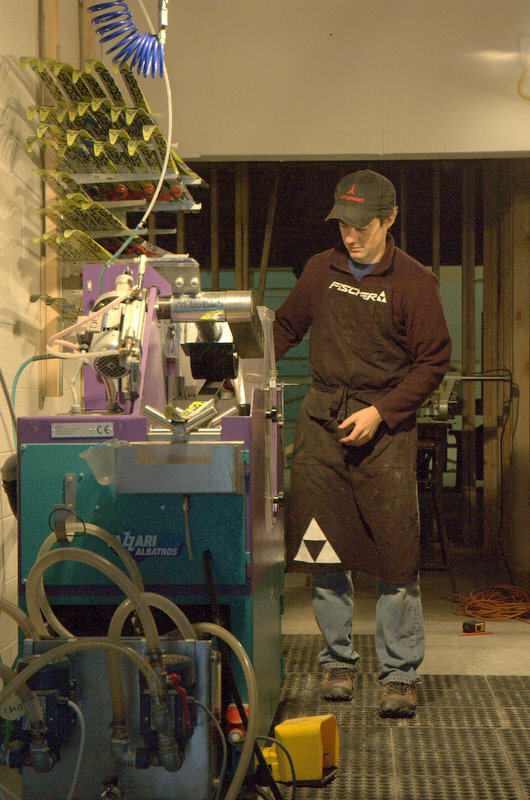 His stone grinding machine is a Tazzari RP-23 (www.caldwellsport.com/ski-service/grinds/tazzari-rp-23), which allows him to efficiently and consistently produce some of the best and most popular grinds in North America. Zach also has international level expertise in the business of evaluating and selecting skis. XC Ottawa speaks from experience when we say that in working with Caldwell Sport can really simplify your life when it comes to choosing the right skis to carry around with you to races, and the right ones to put the expensive waxes on for race days! The Squamish location is exciting for a number of reasons. His wife, Amy, has now been coaching the Callaghan Valley NADC since early summer and has certainly been enjoying working with new athletes in a spectacular environment. Zach himself is pretty excited about being based at the location for the upcoming Olympics, and all the opportunities that this brings for applicable research and development projects. When it comes to skis and grinds for the Olympic venue, Caldwell Sport is sure to be an unparalleled resource. Finally, Zach is also very pleased to have acquired the services of well-known Canadian ski racer and Callaghan Valley NADC member, Chris Werrell as his Canadian retail manager. If you are looking for top quality stone grinding, or professional help with setting up your fleet of racing skis for the winter, be sure to check out Caldwell Sport. Zach at his "desk", the Tazzari RP-23 grinder. Chris Werrell holding down the flex testing bench. XC News: Canadian World Cup: Everybody Ready? CSM: 2012 CSM Discount Registration Deadline - Nov. 11th!